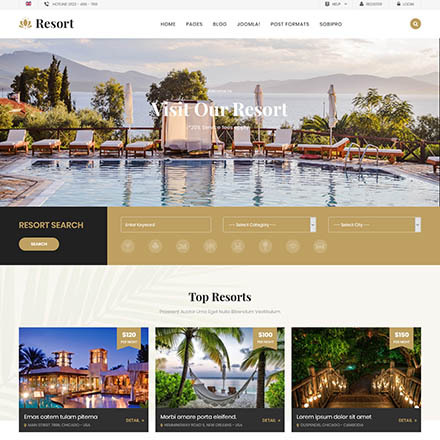 Sj Resort II - Resort and Hotel Joomla Template is specially designed for resort, accommodation, bed and breakfast and any type of Hotel Business who offer accommodation related services. Sj Resort II comes with a beautiful and unique design that will dynamically fit for your online web presence. The template is 100% responsive design and tested on all major handheld devices that ensure your web page will well display on any screen resolutions. The Joomla resort template supports necessary features for your online presence like room, blog, testimonial and room description page etc. Besides, Sj Resort II is based on SobiPro component with the SP Page Builder (free version) and the powerful YT Shortcode built-in help you to easily customize your website and build the content without much coding knowledge. Sj Resort II can be a great choice for your online hotel, resort. Let's explore more now!